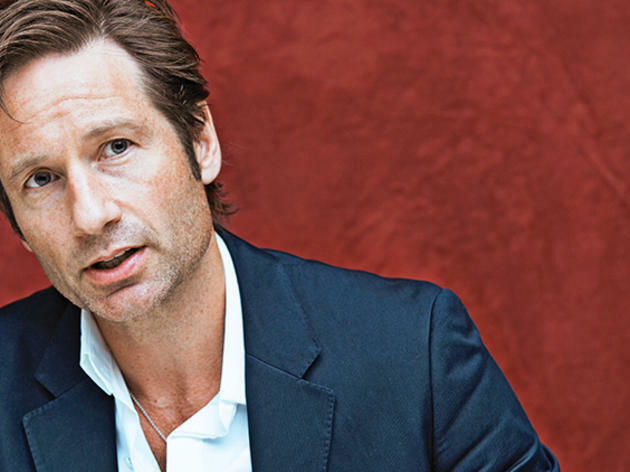 Best known for playing eccentric characters on The X-Files and Californication (which are both streaming on Netflix), it’s no surprise David Duchovny has a quirky side. But who knew that the star actually studied English literature and began a Ph.D. program before focusing on acting? Now he’s returned to his literary roots by publishing his first book, Holy Cow, a hilarious allegorical tale about a doomed American dairy cow named Elsie who decides to move to India. 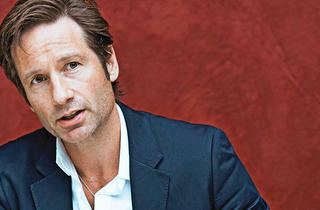 As if you needed another reason to swing by the bookstore to pick up a copy, we caught up with Duchovny to talk about his writing inspirations and adding “novelist” to his résumé. What first sparked the concept for the novel? I had this flash of an idea: If I were a cow, I'd want to go to India. And then I tried to figure out where other animals might go to be safe, and I came up with a pig going to Israel and turkey to Turkey. I pitched it as an animated film to a couple places; when they passed, I just put it in a drawer. But I always liked the idea. Then one day last year, I woke up remembering it and thought, Why don't I write it out? Now that it’s out on paper, do you think an adaptation might happen? That would be the height of beautiful irony. But animated films have to reach such a large audience, they generally don't touch on any issues that might be controversial, like religion, drugs, politics. There's some of that in the book, so I'm skeptical. But even with those facets of the story, you do describe it as a children's book. Do you actually see parents reading it to their kids? I didn't really aim for a particular audience as I was writing. It felt like a kids' book because it was an animated idea, and it centers on animals. That drove the tone. As I went on, I realized it's also for adults. I would imagine you could read it to a young child and what they didn't get, what went over their heads…well, no harm, no foul. Speaking of the talking animals, I really loved Elsie's voice: so charming and colloquial. Can you tell me about developing that style? Spend any time with cows as research? Ha, no, I've spent very little time with cows in my life. The voice, it announced itself to me as I sat down to write. As I said, I had the idea a long time ago, but I'd never written anything of it, except maybe a few sentences about a cow, a pig, and a turkey trying not to get eaten by going to these sacred places. When I started to sketch it out, I realized it would be written in Elsie’s voice and in her being aware of it as a story. And part of her tone comes out of listening to my daughter, who is 15, and hearing her and her friends talk. Elsie fell in that ballpark. She’s high-spirited. Not jaded. Throughout the story you throw in these parenthetical bits where Elsie relays some her editorial feedback. Is any of that true to your experience? Not at all! All of that came out of my sense that it would never be made as a movie. The editor, in my head, was someone at a studio saying, “You know, we're not going to make a movie about Muslims and Jews throwing rocks at pigs.” Jonathan Galassi was my editor on this, and he was very gentle and helped me in areas that weren't completely sketched out. In writing, you, or Elsie, really had no mercy in stating how stupid humanity can be. Did you ever feel like you needed to rein in that criticism, or was it important to you to be as brutal as possible in order to be true to Elsie's perspective? I think that's well put. There’s a part in the book where Elsie’s editor says, “No, it's too polemical. You're alienating people. People buy books, not cows.” And Elsie remarks, “It's like banging your head against a wall. Eventually the wall’s going to break.” I don’t feel like it's a polemical book. I don’t write fiction in order to make a point, but I am very aware of and concerned of the environment and animal cruelty. But I didn't write it as a polemical tract. Could you expand on your relationship to animal rights a bit? I've been a lazy vegetarian since college. I read A Diet for a New America, which was kind of that generation's Fast Food Nation. That opened my eyes to the living conditions that livestock were raised in. Like Elsie in the book, I don't argue with the dog-eat-dog, survival-of-the-fittest that I see in nature. I would never, as she says, ask a tiger to eat alfalfa sprouts. But since then, I've been interested in it, mostly from the perspective of the cruelty and not so much just that it’s wrong to eat the flesh of another being. Which it may be. As a human being, it may be wrong. I move toward that as I get older. And I'm as concerned as anybody with protecting the environment. As Elsie says, the meat-eating lifestyle, whether or not it’s wrong, the way we keep cattle and pigs and chickens, the sheer numbers, it’s ruining the earth. As I was reading, the book’s tone, this intersection of humor but also keen awareness of the strange humor and tragedy in life, reminded me of Calvin and Hobbes. So I was wondering what works inspired or informed your writing? When you say Calvin and Hobbes, I think of John Calvin and Thomas Hobbes. I think you're referring to the comic. I am, I'm referring to Bill Watterson’s work. I don't know it at all. I've certainly aware of it, maybe I've seen it, but I've never read it. My influences were more like the Walt Disney animated features, with talking animals, Charlotte's Web, Animal Farm, Aesop's fables. Really, the stories of my childhood, which mostly centered on animals. Fables, morality tales. Should I read Calvin and Hobbes? Absolutely. Based on your book, I think you would appreciate it. It's about a little boy and his stuffed tiger, which comes to life, and they share these funny but poignant moments of looking at the world and learning about it, together. I had no idea. I'll check it out. Thank you. Now, before acting, you studied literature and began a Ph.D. program. Did you always think you would write a book someday? When I was in graduate school, I thought that if I were a professor, I could work eight or nine months a year and then have time to write. So for a long time, the plan was, “How do I live my life in order to write?” I started acting because I thought I wanted to write plays. I was looking to write anything. I came to acting from the idea of writing. That precedes anything. If you'd asked me what I was…I wouldn't have said actor until I was, like, 30. I would've said writer. And my favorite question to ask of anyone: What are you reading or have read recently that you'd recommend? That's a good one. Let's see.… I’d definitely recommend Dept. of Speculation by Jenny Offill. That was a total surprise because I had never read anything by her. And I thought it was completely original and very sad, very moving. Very smart. Very beautiful.